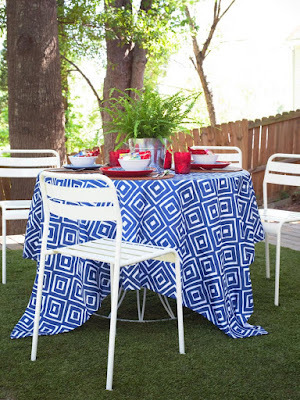 This Memorial and/or Independence Day try using red, white and blue in new, unexpected ways to create an American summer soiree. Consider these entertaining ideas to make your gathering both patriotic and practical. 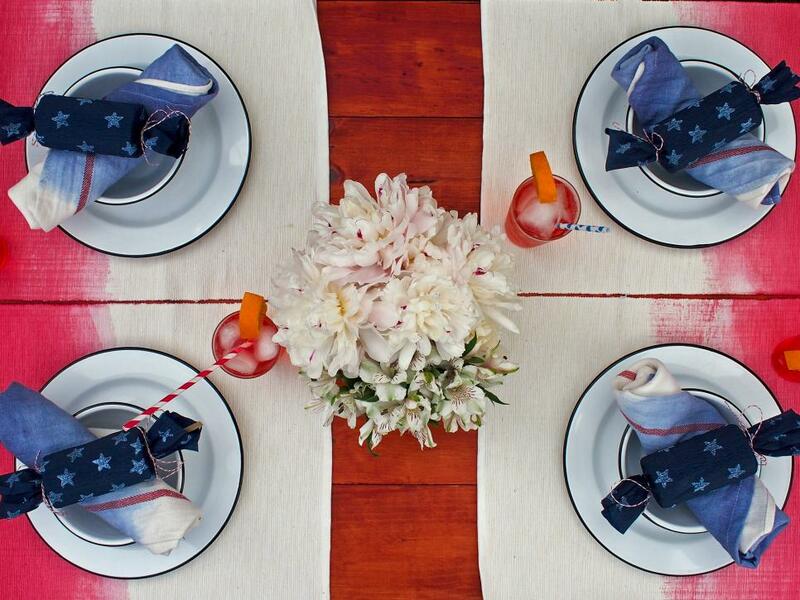 Ombre Party Linens ~ Give your plain white placemats and napkins a modern and patriotic update. Dip-dye using red- and blue-colored dye for a stylish look that can be used all summer long. 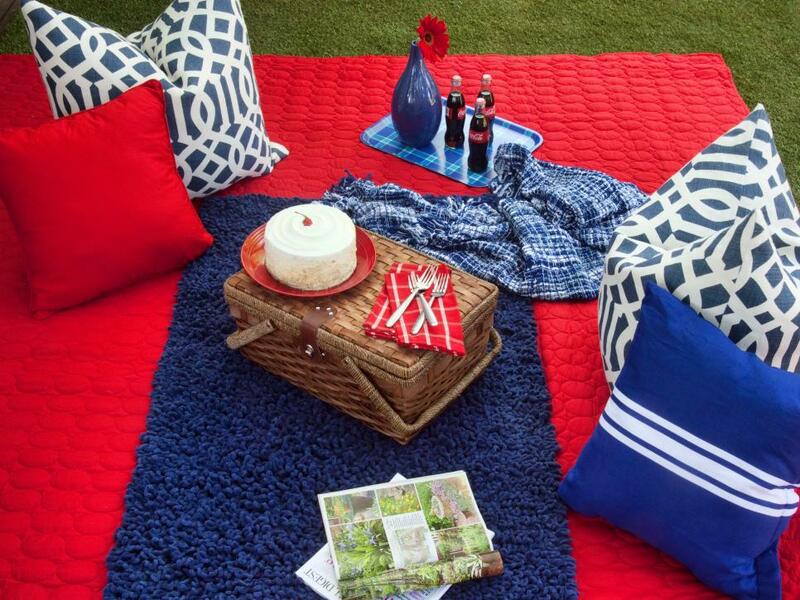 Patriotic Picnic ~ Add a little romance to your Independence Day with a red, white and blue picnic. For a true designer look, introduce a mixture of patterns and textures through floor pillows, toss pillows and blankets. To delineate a portion of your picnic area as a serving space, layer a contrasting bath mat or small area rug in the center, then utilize the surrounding space for lounging. 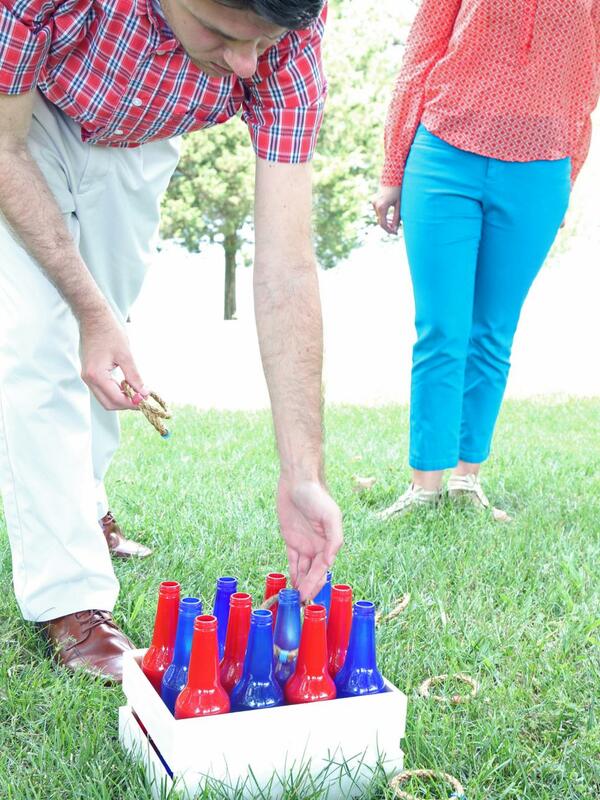 Fireworks for Guests ~ Make your placeholders useful, fun and interactive with poppers. Simply wrap the packaging with natural twine, then add a paper tag. 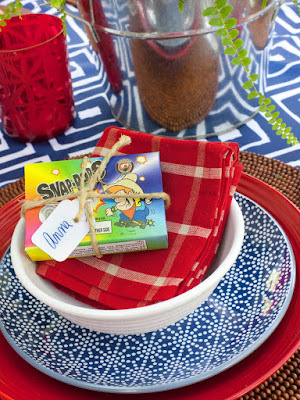 Guests will not only know where to be seated, but they'll each have their own supplies to kick off firework festivities. Festive Dessert Basket ~ Easily serve your dessert outdoors in a simple basket decorated for the Fourth. 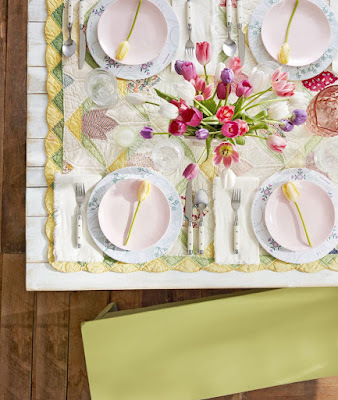 Place floral foam in the basket to serve sweets on sticks, which can double as a table centerpiece. 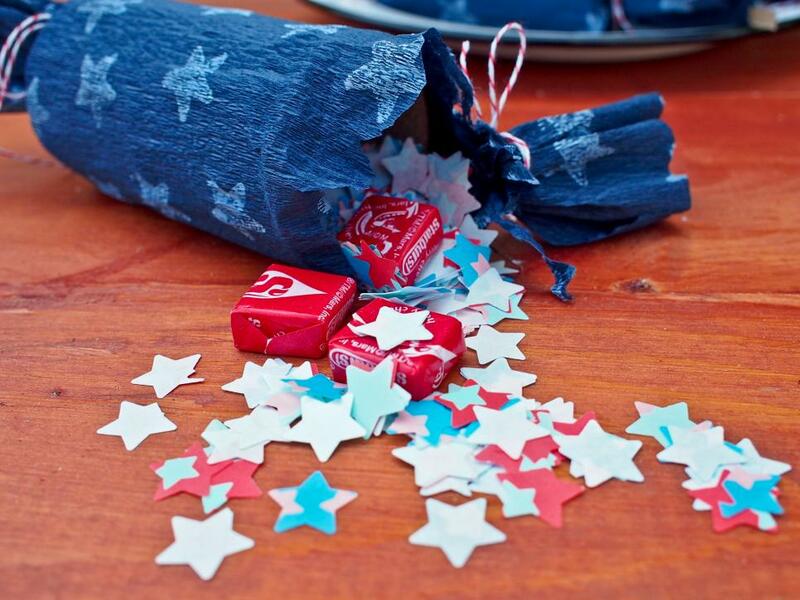 Sparkling Favors ~ Instantly turn sparklers into placeholders or party favors with ribbon and paper tags. Once the sparklers are removed from their packaging, bunch them up, then tie them together with red, white and blue ribbon. Before tying and curling the ribbon ends with scissors, slide a hole-punched paper tag through one of the strands with your guests' names proudly on display. 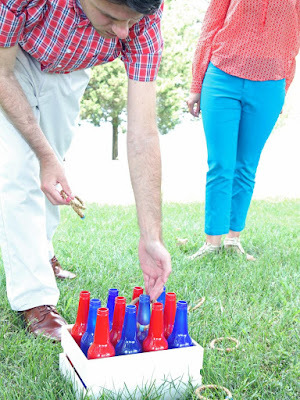 Outdoor Ring Toss Game ~ Give your guests something interactive and enjoyable to do. 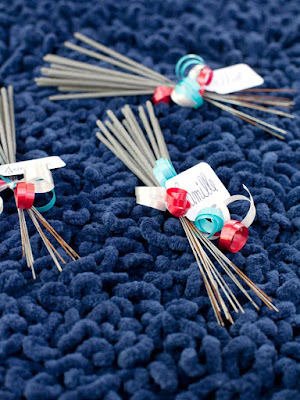 Set up a DIY ring toss game, and give a prize for the winner to take home with them. 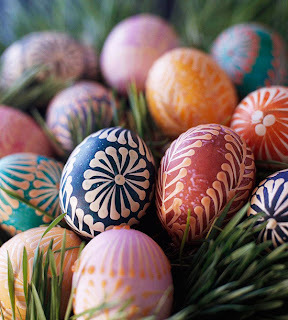 Simply spray paint bottles in red, white and blue and place them in a sturdy box. Modern Patriotism ~ Who says Fourth of July decorating has to be all stars and stripes? Give your Independence Day decor a modern update by introducing red, white and blue through modern graphic patterns. 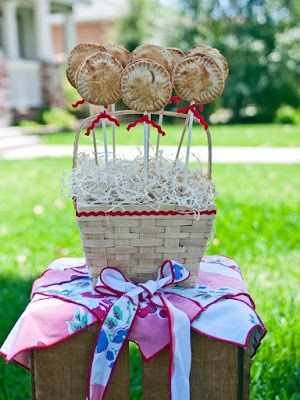 Flameless Party Crackers ~ Kids and adults alike will love playing with party crackers filled with their favorite treats. 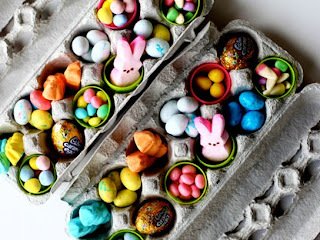 Make your own using toilet paper tubes, glue and crepe paper. 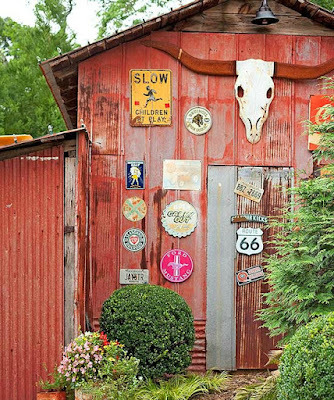 Sun Supplies Station ~ With the harsh summer heat and intense rays of the sun in full effect, it's important your Fourth of July guests remain hydrated and UV-protected. 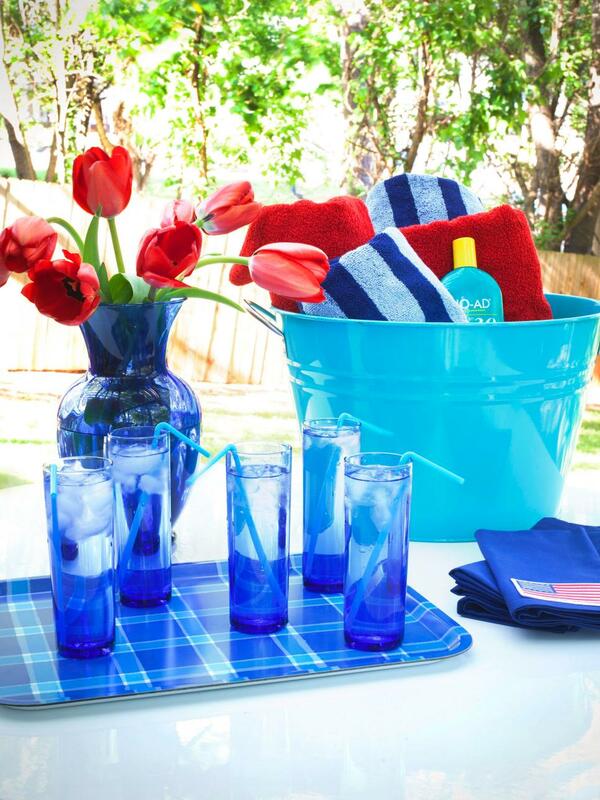 Keep outdoor essentials nearby with a supply station stylishly stocked with rolled towels, sunblock and ice-cold water. 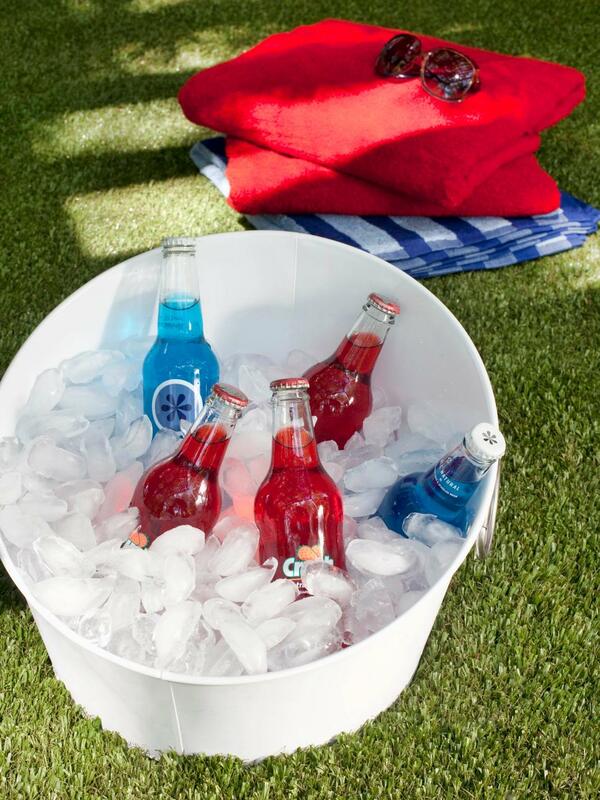 Red, White and Blue Refreshments ~ Think of cold beverages as a decorating opportunity. Chill berry-flavored bottled juices or sodas in metal tubs filled with ice; you'll not only keep guests cool but also sneak in a few extra red, white and blue touches to carry the party's patriotic theme.